HOT OFFER! 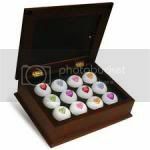 Valentine Hearts Wooden Keepsake Box – The Valentine Heart Wooden Keepsake box comes complete with one dozen Heart Logo Golf Balls. This wooden container features a glass picture frame top that’s perfect for photos of your kids, your loved one, or anything else you can imagine! Inside, the golf balls are kept secure by a foam insert placed between soft felt walls for superior protection. Makes a great gift! Next articleGolf Deals – How To Find The Best Deals To Save You Money, Lots Of It!